me, i deserve a medal! 3 sept – stumble upon rad raleigh rc 300 bike at my fave second hand shop. R850 for a bike worth 6 grand new. of course no-one mentioned the additional grand (i’m sure it was more!) i’d be spending on set-up, cleats, cycling pants, etc. after some prevaricating, i pull out some plastic. 26 sept – go for my first ride at cradle of humankind. ok. this is doable. 21 nov – the 94.7 cycle challenge; just shy of 100km. i was most certainly not planning to ride 100km. not when i’d only ever been on the road 6 times, only had about 150km under my belt and never done more than 48 in one go. no way in hell. 20 nov – after not riding for most of the week because of a glute strain, i drive to sandton and sign up at the expo. yeah, call me crazy. 21 nov – we’re in the front of the line at 9pm when the whistle blows for our group. after what felt like an eternity, almost 6 and 1/2 hrs (5h37 in the saddle), 2 falls, 1 puncture, and a few all too short recovery stops later, i save my last spurt of energy to pretend to sprint across the line. halle-fricken-lujah. my right knee has been in agony since km 54, i’m exhausted, and i got there by sheer force of will, but i did it and i have the medal to prove it! exhausted, but delirious... and oh yeah, in the interest of sun-protection, i was the only person in that race covered almost from head to toe! 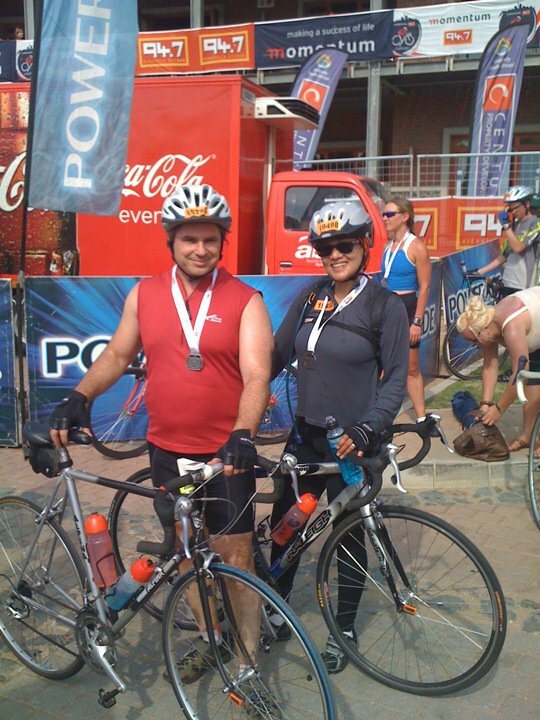 This entry was posted in life and tagged 94.7 Cycle Challenge, Cycling, insanity, Sport, undertraining. Bookmark the permalink. I woulda been covered like that too! I’m impressed you finished it!